As recently as 2014, China seemed like an unstoppable financial juggernaut. The GDP of China had surpassed that of the U.S. using a purchasing power parity (PPP) measure. (I don’t consider PPP the best way to measure GDP. I use a measure that still shows the U.S. as the world’s largest economy. But many publications were shouting, “China’s No. 1!” when the PPP news was revealed.) China’s hard currency and gold reserves exceeded $4 trillion, and its economy was growing at over 8% per year. Suddenly, conditions have changed for the worse — much worse. Growth has slowed to 6.7% per year, and even that is overstated. Much of the “growth” is from wasted infrastructure investment that should be written off before the cement dried. China’s debt-to-GDP ratio (counting provincial debt and state-owned enterprises) exceeds 200%, about double the U.S. and not far behind profligate Japan. Most worrying of all, China’s reserves have fallen by almost $1 trillion and continue to bleed at a rapid rate. These capital outflows are driven by businesses and individuals who worry about the devaluation of the yuan. Any party holding yuan balances will lose money measured in dollars, euros or gold unless they can get the money out of China. Capital outflows from China explain the booming housing markets in New York, Vancouver, Sydney, London and Melbourne. Chinese are buying luxury condos they don’t even live in just to get their money out of China and into hard assets in another currency. We’ve seen these capital flight crises before, in the U.K. in 1992, Mexico in 1994 and Argentina in 2000. They always end with a “maxi-devaluation” designed to stop the bleeding once and for all. U.S. stocks fell 11% in August 2015 when China devalued by 3%. A new 20% devaluation by China would probably push U.S. stocks down 30% or more in a borderline panic scenario. Crises like these can be avoided for a time but always end the same way. 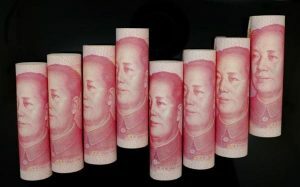 Click here to see why a currency shock from China, with ripple effects around the world, is growing closer by the day.